Listening to the ongoing interviews, my anxiety escalated. Next to meeting one’s Creator and listening to His judgment, an interview with a consul could be the most heart-pounding experiences a person, especially one from a third-world country like ours, could have. Furthermore, I was fully aware that some factors could be taken against me. I am young and single. I don’t have properties under my name. And neither do I have a fat bank account. By the time my number was called, two of my fellow paper presenters have already been turned down. “You can’t afford that trip, it’s too expensive for you” said the consul to a colleague whose salary is equal to mine. “You’re too young to present a paper” was the reason another young faculty researcher like me was denied. When 2025 was flashed on the queue screen, I proceeded to and lined up at the designated counter. The consul was attending to the woman before me, a yuppy working in Makati. Their conversation was pleasant and jolly, and that made me feel a little relaxed. However, towards the end of the interview, the consul suddenly became serious and told the Makati girl, “I am sorry…” and handed her a blue paper detailing why she was not granted a visa. He dispensed an advise on what the applicant should do next. And then it was my turn. I moved forward and greeted the consul. Me: I am doing well, sir. Consul: What is your purpose of going to the US? Me: I am presenting a paper at the Nakem International Conference at the University of Hawaii at Manoa. Consul: Tell me what your paper is about. Me: My paper examines the “English-only policy” being implemented in some Philippine schools and its effect on linguistic education and learning at large. Consul: Why does that interest you? Me: In Laoag City, my hometown, there was a case of three students expelled from school just because they spoke Ilokano inside the campus. As a writer and sociologist, linguistic justice and cultural integrity is very close to my heart. Also, the use of the mother tongue in the early years of basic education is now being enforced by the Department of Education. Consul: Use of the mother tongue? Is that really beneficial to students? Me: Yes, sir. Various researchers positively correlate the use of mother tongue to higher aptitudes in science and math. In developed countries like Japan and South Korea, for example, science and math education are done using the native languages. “But I don’t get it. Filipinos’ facility of English seems to be deteriorating. Won’t it decline further if native languages are used in school?” the consul asked in what was beginning to sound like a thesis defense. Me: No, sir. Using the L1 or an individual’s first language will better prepare him to learn an L2, a second language, and so forth. In the case of many of my students in the university, they cannot write good Ilokano, and neither are they confident with their English or Filipino. Fortifying a person’s linguistic foundation must be done in the early years of schooling. Me: Thank you, sir. Thank you. Still holding the documents I brought which he never asked to see, I walked away from the booth feeling like it was just a crazy dream. An American consul speaking in very fluent Ilokano! But why? Out of curiosity, I returned to the consul’s counter as the person next in line was beginning to step forward. As I walked out of the building, I bought a coffee mug at the souvenir shop to remind me of the pleasantly odd experience. Two days later, my passport arrived through courier. Neatly pasted on it was a 10-year multiple-entry visa. Haha! Congatulations, Herdy! My best wishes as you travel to the US! 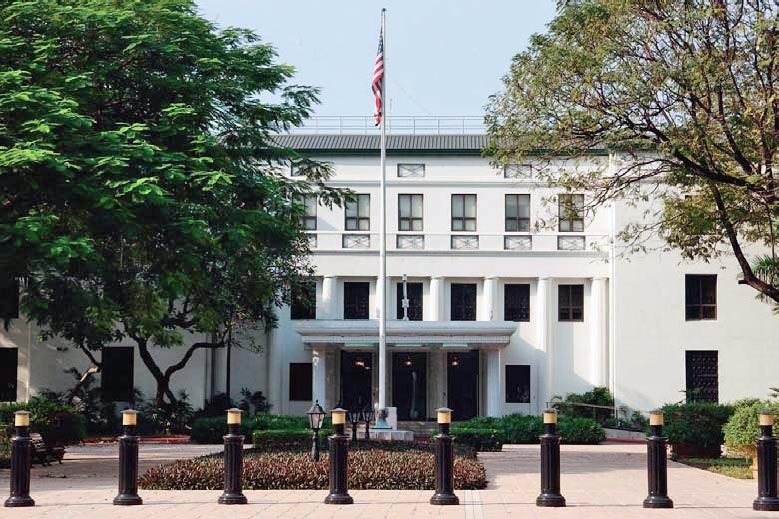 Your experience at the US Consular office was very amusing and encouraging . . . Saludos y que Dios te bendiga! Yes, sir. It sounded like a thesis defense.. Hehe.. Thank you po..
congrats Herdy on your new journey…congrats also to consul who is trying to learn Ilocano dialect indeed.. Thank you, Alexis.. and regards to Apo Letty..
You are right, Ilokano is a language just like, Hiligaynon, Kapampangan, Bicolano, etc.. Within the regional languages are dialects like Kinaray-a, etc. how do you diffrentiate a language and a dialect ? Many have been asking about this, so am writing a full article soon as an answer. Interesting. All along, I always thought that only the National Language is considered a language and every other tongue spoken in that same country is called a Dialect. Thanks for breaking my ignorance regarding the issue. a dialect is a variation of a language. for example, the Tagalog used in La Union is called a dialect because of the variations being made from the original or pure Tagalog. Mayat! Nagtagalog met jay consul naginterview kanyak way back 2009! If there’s a thumbs-up for this post. I would click it kabsat. and you’re right indeed that its a language… I fancy myself into believing that Ilocano is one of the most flexible and complex languages… defining every little detail of matter. An example is the word “pultit” wenno “tabbel” hehe.. apay adda tagalog na diyay wenno inglish na? awaaan! nag laeng kan lakay.godluck sir. Congrats, Herdy! Katuwa naman! I hope you had a great experience in the conference/Hawaii. Amazing story! I can imagine how jarring the experience was at the embassy—a caucasian speaking Ilocano! (My mom’s Ilocano btw). Thank you. The conference will be on Nov. 14-16. That was indeed a very pleasant experience. Hope so.. where are you from? The issue is not as simple as you think. kinitam koma a no nangisit met sikona…. Nakalongsleeves ngamin isuna idi, ngem ti panagkunak ket haan met..
Nahiya naman ako. Buti pa si Mr. Consul, he can speak Ilocano. I can barely even understand it. My paternal grandfather is from Laoag, while my maternal grandmother is from Aringay. My sister & I studied in Baguio but only she learned how to speak and understand it. Congratulations sir! I was laughing and happy when I read your blog. Imagine a US Consul can speak Ilocano unlike our kababayans nga adda iti ballasiw taaw, nalipatandan iti agsao iti Iloko wenno dagitay adda dita lugar tayo nga kasla saanda nga ammo iti agilokano. I was like you sir when I applied my Visa at the Bristish Consulate .Makapakigtot ta nag Ilocano metten. God bless and enjoy your trip to the US! Thank you, ma’am. Hoping to listen to your story in detail as well. Congratulations Herdy. You deserve it and I hope you will continue with what you have started in your teaching career and most especially hold on to your philosophy. I learned Ilocano when I taught for 6 years in MMSU Batac and still learning thru conversations with Ilocano friends. Ammo na a ngata dagita alutiit ngem ammo pay nu mangmangan dagita ti saluyoy kada kabatiti. Addo ditoy california ti naduma duma nga nateng ngem uray dagitoy uubing ti Pilipino nga naiyanak ditoyen ket madi da pay tu pay nga kayat nga ramanan ti munamon ken bagoong. Nasayaat kabsat ta napagasatan ka nga umay ditoy. Addu da ti ilokano dita Hawaii. Bug-goong and patis are not the best things to be enjoyed cause they have that strong smell and certain taste. My older son’s mouth is very sensitive. His lips swell when he eats something with bagoong. He likes marunggay and saluyot without bagoong or patis. What an experience!!!! Enjoy your trip, sir herdy!!! true Sir Herdy, when i accompanied my sc parents for their scheduled interview last year at the us embassy ,the consul asked my parents which language do they prefer, ilocano, tagalog, english my parents replied ilocano sir, (knowing that the console have an ilocano interpreter) but what a shock, mismo jay americano console ti nagdamag using ilocano language. dua laeng sinaludsod na 1. sino mangala kenka? sister ko sir. 2. anya ti trabaho na. ? nurse sir. Okey agkikitakayto kada sister yon Sir herdy naglag-an ken nakaisem kami pay kasi nasingpet jay consul officer ammona ag-ilokano w/ smiling face pay. Such a joyful story as well. Long live multilingualism! Umay kayo kadi met ditoy Toronto Maestro? interesting yung story mo Herdy, wish i could read the the paper or a simple write up about it 🙂 I have many ilocano friends maybe because nsa baguio ako pero hindi ako ilokano 🙂 but i do believe sa idea ng foundation of education using the mother tongue, ako mismo hrap na pure ilonggo ako pero i cant write but speak the dialect.. I have been denied twice already… Meron bang consul marunong mag-bisaya? Wish ko lang.. Herdy, nasa US ka na ba? Am still in the Philippines. There must be some consuls who study Cebuano to. Lady Luck uck really plays a major role. Good luck! It is not sound to attribute getting a visa to God, for it will imply that he favors less those who are denied by a consul. Luck still really plays a factor. God is in control, Herdy. Nothing comes by chance. Either the LOrd will allow something to happen even if it’s not within His pleasure (we call it His permissive will) or He will not allow it to happen because it’s against His will; or He will let it happen because it is His will. And I believe when you uttered that prayer with sincerity and humility, He quickly answered you and gave you your heart’s desire. Also, I find it refreshing — and interesting — that the consul blessed you with a God be with you goodbye. He may have seen your sincerity and appreciated your honesty — plus the Lord worked on his heart. For all we know, the consul is learning Ilokano in preparation for a missionary stint in the Ilocos region. Congratulations, Herdy and Godspeed! Thank you, ma’am. I believe in free will, with God guiding and inspiring us in its responsible exercise. With all due respect, I do not believe in a God that imposes his own will. I respect your opinion though, and I’ll leave it that way. God bless you, too. Your conversation with the consul struck a sympathetic chord of pleasure in me. Way to go, Herdy! Agasem! Nagmayat ah! Congratulations! A very good interview, indeed! That was an amazing, unusual and heartwarming experience at the us embassy. Thanks for sharing. hi Herdy, your story is very inspiring and amusing. Btw, is your consul a man or woman, old or young? just curious since my parents got denied twice in the US embassy already and it really hurts our pockets but it’s a relief to hear stories like yours, very rare and unique. Congratulations! Nagmayat ta experience mon! Ngem maymayat koma no ammo tay nagan tay Consul.. I wasborn in Pangasinan but barely speak Ilokano ^^ God Bless ! Glad that you had met a pleasant consul during your interview and got your 10 yrs multiple visa… You replied in a previous comment that Ilokano is a language and not a dialect…Can you elucidate me on that? And how would you classify Bicolano, Bisaya, Kapampangan, Waray, Ilonggo, and Chabakano? If the national language is Pilipino which is Tagalog? Thanks. hi sir that was a really very unusual thing, hearing someone from the other country spoke in a language of our own, but at the same time it will make us feel proud. baka mabasa da datoy blog mo ti superiors na baka mabwi ta visam. Nope. Apay koma? Baka mai-promote pay isuna a for building bridges of understanding. I commend you. My father side hails from pangasinan and I honestly do not know any Panggalatok nor Ilocano words. Good luck on your trip. It is variably called Iluko or Ilokano, and it is a language, not a dialect. Dialects are variations of a certain language. Bicolano, for example, varies to some extent in various provinces or towns. The mentality that Filipino or Tagalog is the only language and that the rest are mere dialects is so misinformed.. an imposition by the Tagalogs, and Quezon among them, to other linguistic groups. >>The mentality that Filipino or Tagalog is the only language and that the rest are mere dialects is so misinformed..
That was an interesting and amusing account. Good on you for getting a visa which is notoriously hard to get. Let me assure you that even British citizens dread that interview, whether at an embassy or an airport . I would certainly be interested in reading that paper you wrote. I grew up in Manila and now live in the UK with an English husband. My main means of communication is in English. My 2 children do not speak Pilipino, but know a few phrases in Spanish and Pilipino. I was amazed with myself, however, that I understood every Ilokano word you used! I even followed the conversation and comments here completely! My mum was born in Laoag and my dad was from Rosales, Pangasinan but grew up in Manila. I obviously picked up the language during school holidays! Amazing! AMAZING! Have a great time in presenting your paper, Sir! I am greatly blessed by your story! God bless you! wow! congratulations! and i think the prayers you said before going to sleep that night worked! i’m dreading my interview, i have to reschedule it soon. and hope that i have a pleasant experience as you. Congrats brother herdy, you have a strong determination, kas kaniak idi, ta napadasak metten ti nainterview diay U.S embassy, Asi ti Apo, napagasatannak met nga naikkan ti visa ken nakaoan ti naduma duma nga lugar diay america nga uray awan kwarta ken sanikua nga Impakitak. Talek ken nam-nama lang ken Apo Diyos ti balon ko , tapno masungbatak idi dagiti damagen ti consul. Hope to hear from you again. KEEP UP THE GOOD WORK. Thanks for sharing your experience. God bless,! Cool story! Salamat sa pag share. My parents are from the Visayas but I am proud in saying I can speak Ilokano fluently. Living overseas I miss the language and take all the opportunity to speak it. ilocana siguro ti asawana. What date will you be in Honolulu? Would love to meet you if you have time. Hope to meet you, too. I’ll be in Honolulu Nov. 10-16, 17-27 in Calif and Nevada, and Nov. 28-Dec 5 back in Hawaii. See you. wonderful, wonderful kabsat nice sharing. As i’ve always advice would be applicants to be honest in applying, you reap what you sow. Ti APO ti kumuyog kenka..
Dios met ti mangtarabay kenka. Dios ti agngina. Hi Herdy, Congratulations pards!. I wish you great success on your trip. If you will be in DC area let me know. Maybe we can find a way for you to present your paper in the area too. Thank you, I’ll be able to visit only the West Coast this time. Hope to meet you in future trips. I was fishing once at the Pacifica pier (a favorite fishing ground for most Bay Area residents) and was next to a couple chinese woman fishing too. As we all know, their conversation is a little too loud for most people. But as time drags on, their voice is wearing me off and in my mind, I was thinking of swearing them off in my native tongue, Ilocano. Something hold me back, instead I started to have a conversation with my wife instead. Lo and behold, one of the woman turn around and asked us in Ilokano with a very undeniably familiar twang. It turns out, she was born in Paoay. Imagine if I had said anything derogatory about them in Ilokano. There’s that old saying, If you’ve got nothing nice to say, Dont say anything AT ALL. Nice story. I am glad you held back. Idi maudi a papanko’t Hong Kong, ugalida ti kasta, agintsikda ngem ammon nga iinsultoenda kan.
Gusto ko rin matutong mag-Ilokano. Anong pwede kong basahin para matuto? Hihi. Tears keep flowing in my eyes, I don’t know why, but I am very happy for you….good luck!!!!! Bro my Ilokano is very limited as I only served two years in the the Ilocos through Pangasinan region. I admire so much the Ilokano cultures. Their thrift and frugality much more hardworking people I really admire so much. Thank you for the appreciation. Agbiagka, bro! What a wonderful experience! Salamat sa pag share. What a surprising experience! I used to teach at Duke University, and I would apply for an exchange visa every year. My conversations with consuls were mostly about Duke basketball. One consul was a University of North Carolina graduate, and she joked that she could not grant a visa to someone from Duke! It would have been good if I had been lucky enough to be interviewed by a consul who knew Ilokano. It would have made my day! Agyamanak Iti pabangibingay mo Iti daytoy a kapadasam. Agtultuloy koma a naimbag ni Apo Dios kenka. Dios ti agngina, apo daniel. Nice to meet you here. Nagsayaaten ngay ta dayta kina ilokanom ti rason nga inikka na ka ti US visa, 10 yrs multiple entry pay! Nasisita pay, ma’am, a maipakitam nga adda sublianam ditoy Pilipinas, ken haanka nga ag-TNT. Nakita na siguro a napateg kanyak ti trabahok ken advocacy’k ditoy. anyan…nag-praktis ti ilokanona kaniyam ni apo kano! HERDY CONGRATS DIOS TI AGNGINA APO! kastoy gayyam iti rignana, naragsak nga makabasa iti kastoy. maysaak nga FBI (Full-Blooded Ilokano), naiyannak ken dimmakkel idiay Laoag. adu iti padas kun iti sabali nga lugar iti Luzon, ngem tatta ket addaak iti lugar dagiti Arabo, sobra iti iliw ko nga mkabasa ken makangngeg iti kastoy, mas narignak iti iliw ko iti pamilyak. nkaasawaak iti tagalog ngem imbatik isuda pay laeng idiay Laoag, uray tagalog iti sau mi uneg balay mi, proud nak ta nakasau ken maka awat dagitay ubbingko ken ni baket ko iti ilokano. Agbiagka, apo edison.. Dios ti mangtarabay kenka ken iti familiam. Nu kasta da kuma amin hahahaha..mayat, mayat..Congrats pards! Wen koma a, pards.. Thank you! Hope to see her in Honolulu. All the best. Thank you. Languages are really bridges of understanding. I’m glad consuls speak Philippine languages while I’m saddened that certain educational institutions bar the use of native languages on campus. Hi Herdy, salamat sa kuwento! Ilokano ako pero laking Maynila kaya hindi ako ganu’n karunong magsalita. Haha, kinabog ako ni American consul! :)) Your story makes me want to learn to speak Ilokano more! Salamat uli, more power at God bless sa presentation mo! As a huge fan and believer of the preservation of L1, I’m so happy to read that there are Filipino Educators who are working towards the preservation of L1. I’m glad you were granted a Visa! Let’s not waiver in the struggle for linguistic justice. Long live all Philippine languages! naragsakan nga husto ito pusok idi nabasak diyay blog mo. pati diyay consul ket mamati met iti bi/multi-lingualism. ad-ado pay kuma a parabor iti madawat mo kenni Apo Diyos kadagiti nagad-ado pay a taw-tawen nga inayon Na iti nakapinpintas a biyag mo. Dios ti agngina, Apo Rey. Dakkel ti namnama para iti multilingualism no haan tayo nga agkedked a mangitandudo kadaytoy. Good morning Herdy! your story makes my day… So proud to be an Ilocano. Good luck for your trip and enjoy. Dios ti agngina! Thank you, Apo Enrie. Agbiag ni Ilodano! Congratulations Herdy! Daytoy ti resulta na no agkararag ken ni Apo ket idalan na ka iti nasayaat. Thank you for reading. It’s terrible to have an experience as amusing as this and not many to share it with. Yes, that is usually the case. Congratulations sir a very nice and inspiring story! Browsing at the comments and i noticed that some Ilokanos whose families relocated to another place in the Philippines admittedly have a hard time speaking the ilokano language fluently. It’s the same here in America, you will notice that most pinoy kids born here cannot speak our native language ( there is no study made on this that i know of, but I would say probably 95% of pinoy kids born here cant speak tagalog or their native geographical language but would claim they understand a bit) . I remember a Russian co-worker back in NY who told me she has to sit down with her 2 toddlers at least an hour a day to teach them how to speak and write Russian. Her kids are now in college and she said they are fluent in their native tongue and she speaks with them in Russian most of the time to perpetuate their language. Other immigrants here in the US are much better in teaching their kids born here in America speak their native tongue, such as the Chinese and Hispanics. So it really amazes me that a caucasian folk can learn to speak our native language when most of our kids are naturally unlearning it. Surreal! Yes, that’s how i felt, too. Thank you. HERDY, agyaman aq ta naisurat mo daytoy. Saan gayam pudno nga awan Amerikano nga nasaat ta idi agadadal aq ti UP idi 60’s “IMPERIALISTA” da amin. I believe that no matter how hegemonic activists say US is, it is still a leading exponent of multiculturalism. I really enjoyed reading your blog. Yes, indeed, consul interview can be a nerve wracking experience for many but fortunately I was assigned to not too harsh consuls during my interviews, same as with my mom. She said her interviewer also speaks fluent Tagalog which makes a lot of advantage for my mom during her consular interview. This was being passed around on Facebook, and I wasn’t sure if I should comment. I’m one of those weird cases who is a Filipino but has better mastery of English than Tagalog, and my ability to learn other languages has been less than stellar (my Spanish is atrocious). Though I can tell foreign languages apart without much trouble… I just can’t speak them. I also don’t have much knowledge with other Filipino languages because I don’t travel as much. Anyway, I just personally wanted to say I really enjoyed reading this, and I wish you all the best. Thank you, sir. I am honored that you read this post, and shared your thoughts as well. Thank you for clearing up the language/dialect controversy. I am also a proud Ilocano born and raised in Hawaii. When I first arrived in the Philippines I greeted people in Ilocano (a line or two learned from my grandparents) and was amazed that people did not understand me. I soon realized that Tagalog was the national language. I was so naive. But I am now surprised that Ilocano is also a language and not a dialect. So much to learn from a filipino, born in Hawaii and living in Japan. Congrats on relying on God to help you through the interview. He certainly knew how to make you smile. 10 year multiple visa…wow, now go to the beach in Hawaii and enjoy. Go to Waipahu and meet all the people who immigrated from Ilocos Norte. Dios ti agngina, kabsat. Aloha! congratulations katribu! it really is true, when going through interviews like these, to be honest and be yourself. Should serve as inspiration to others. Never attempt to lie. kasi baka sakbay ti interview, na-check-up da aminen dagiti info nga insubmitar mo. ken eksperto dagita nga ag-detect iti agul-ulbod. baka multi-lingual pay dayta. ammo da nga adu ti agpalusot nga mapan ballasiw-taaw (to visit kuno, or as tourists) tapos awan met gayam plano da nga pumanawen. Thank you. The cynicism of consuls is not entirely unfounded. Too bad the decision of some, i.e. to go TnT, affect legit travelers. I strongly believe that all of these were because you prayed to God and you even prayed for the Consul. It matters! More power… I also queued for a US visa but apart from the rigors and drama of preparing for the interview, my real interview was not as exciting as yours and i got the visa and had my first vacation and travel early this year! Thank you, Sir Jerry. I emailed you my postal address. Thanks. Congratulations! I would have saddened if you didn’t get a visa from that lengthy question and answer. Mannurat ken mangisursuroak met iti Tagalog ken Ilocano. Ti panagkonak, naipostsa ti consul nga nag-interview kadakayo iti Hawaii ta AMIN (with exaggeration) nga naggigyan idiay Hawaii ket makasursuroda iti Ilocano gaputa Ilocano ti kaaduan nga sabali a sarita idiay Hawaii. In the same way, consuls learn Tagalog when they are assigned here in Manila. Ala ket padasenyonto man daytoy obserbasyon ko no mapankayonto idiay. Congrats manen! Your experience at the US embassy securing a visa was indeed an unusual one. I was under the impression though that they only give five years multiple entry. I guess for first timers, they still give 10 years. My first three attempts to get a US visa were all denied way back in 1977. I will write my experience one of these days to parallel yours but in a different light. Good job and represent us Ilocano’s. I was born in Manila but raised in California all but 5 years of my life. I can speak Ilocano but it is heavily peppered with English now. Have a safe trip and enjoy Hawaii. There are lots of Ilocano’s in Honolulu. Hi Herdy, Im so happy for you. Thanks for sharing. Reading all these comments is an eye opener for me. I always thought that Ilokano Is a dialect. You learn all the time. Im from Abra and proud to be an Ilokano. Enjoy your trip and Good Luck for the future. Let me know if your heading down under. We will catch up then ading ko. God Bless you and your family kabsat! Thank u, mam.. Planning to write more on the language-dialect distinction. Congrats for your success! I read your article via FB post of my Ilocana friend in New York,and it’s timely to share it with my sis who is scheduled for interview at the Manila embasy tomorrow. I AM EVER GRATEFUL TO GOD FOR MY ILOCANO HERITAGE BECAUSE IT HAS GIVEN ME TREMENDOUS OPPORTUNITIES TO PRACTICE 7 LANGUAGES WHICH AFFORDED ME WONDERS BOTH BACK HOME IN THE PHILIPPINES AND ABROAD.YOU SURE GAVE ENORMOUS BOOST TO MY SAGGING ILOCANO PRIDE. Agbiag ni Ilokano.. Hold high! Dakkel unay a panangbigbig ti Amerikano a Consul ti pateg ti pagsasao nga Ilokano, isu’t gapuna nga agsursuro ken agbasbasa tapno masursurona ti agsarita iti pudpudno nga Ilokano. Makaliwliwa unay iti puso ti naaramid kenka, Herdy!. Pingback: Why Are We Happy When a White Person Speaks Ilocano? hahahaa, We have exactly the same experience Herdy. They ask questions and seemingly sees whether all your answers are truthful or not. Ti kapagpaysuanan na, kayak amin nga answeran ti questions ti consul nu la ketdi agpaypayso nga ammom tay field nga inkabkabil mo dita form mo. Nu kasano nga nakasarita ti Ilocano dagita consul ket bay at ti kinaadu nga inin interview dan, adu nga istorya ken adu nga biag ti napan da nasukisoken. Isuda ket nalalaing ken nakasursuron. I di siak, nakapan nam met Hawaii too bcoz of an invitation for a cultural exchange on dances and pageants for a certain Ilocano community. They called it NAKEM too but this was more on of a hands on training on dances and pageants. I directed and choreographed pageants and they represent Ilocanas during Pamulinawen pageants in Laoag City. I didn’t expect a consul who could give some factual infos on dances, ilocano particularly, giving substancial infos on the topic. Ket naanswerak met amin nga dinamdamag na. Just like you, you soon realise nga saan gayam nga narigat ti mainterview aglalo nu tay expertise mon ti damdamagen na. Kitam ket saan na pay inukag tay sang ka bunton nga document ko nga intuit. Hi! Great blog! 🙂 However, just a question.. do you think it would be advisable to get a visa months before your actual travel date/s? Or would this be a problem? Thank you! Hi, Carol.. It’s better to do it months before as you might need to do another interview on case you are initially denied. I have a colleague who was denied a visa at first but who was granted a 10-year, multiple entry visa on his second try a month after. Congratulations Mr. Yumul! I was looking for information for my bf in Kalinga and ran across this article. He told me that he was told that if he wanted to marry me he would need a huge amount of money in the bank to show the embassy he had ways to come to the U.S.A. and now I read that too! Which I think it’s so unfair for him. He’s very poor which he finds embarrassing but I don’t care. He has a heart of gold. So if he has no means to come here and will work in Kalinga for 6 years to have enough just for the ticket to come here for the initial visit because of his little money and intellect will they likely deny the visa? He speaks ilokano and is getting good at English but didn’t even graduate H.S. Do you have any advice? I have been reading a lot of firsthand experiences with US Visa application and yours fascinated me simply because if I were in your shoes I would probably be gushing afterwards. It is indeed a very fascinating experience, more so because of the positive outcome 😁.